Werner Weinberg was born on May 30, 1915 in Rheda, Germany to Elias and Paula Weinberg. Werner attended lower school locally but traveled to a larger town once he reached high school. He continued his studies and became a teacher, graduating from Israelitische Lehrerbildungsanstalt (a seminary) in Wuerzberg, Germany. He taught first in Rheda and then later on, as more and more of the Jewish population left Rheda, at the Judische Volkschule in Hannover. He continued to work in Rheda during the weekends, acting as the unofficial cantor and rabbi for the community even after the stained glass windows of the synagogue were broken. 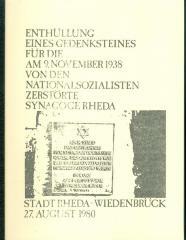 Werner was not present in Rheda on November 9, 1938 - better known as Reichskristallnacht (the Night of Broken Glass) and was warned not to return to Rheda because his name was at the top of the S.S. deportation list as a religious leader of Rheda. Werner would not return to Rheda for 27 years. 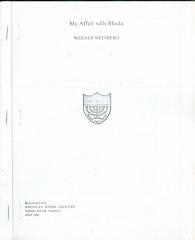 In December of 1938, Werner married his wife Lisl Halberstadt Lisl was a fellow student at the seminary and also a teacher in Hannover. The two of them managed to get visas and move to Holland in 1939. 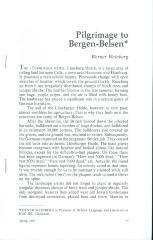 The Weinbergs were in Holland for only a year before the Nazis invaded Holland. 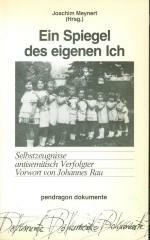 The Weinbergs continued to live under the Nazi occupation but as things became worse for Jews in Holland they considered what to do with their two young children: Hannah, 2 years old, and Susie, only nine months. They decided to place Susie with a Dutch family, found through Jewish friends, in May of 1942. Being parted from both of their daughters was too much, and they decided to keep Hannah with them. The situation appeared to improve, and Werner and Lidl chose to take Susie back. During those few months in the summer of 1942, Lidl had a photograph made of the girls. In October, Hannah (also called Hannele) became ill and without the needed medication she died on November 9, 1942. In January, all Jews left in the provinces were ordered to move to the ghetto in Amsterdam, and by April the Weinbergs could no longer ignore the decree. The Dutch family agreed to once again take Susie, but coming to the ghetto to retreave her was much too dangerous. Werner was lucky that he had a cousin married to a non-Jew and who still had certain privlidges. It was this cousin who came and took Susie back to the Dutch couple to hide for the remainder of the war. 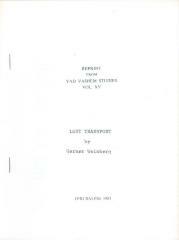 After years of having successfully moved from place to place, and being listed as "Haksharah," a group valued for its involvement for agriculture and therefore among the last to be deported, Werner and Lidl were sent from the ghetto in Amsterdam to the Dutch camp Westerbrok before being moved on to Bergen-Belson. Werner and Lidl were liberated, along with the others imprisoned, by the Russian army. Two months after being liberated Werner and Lidl returned to Holland. Once there they were arrested as Germans but their Dutch comrades soon helped them explain the facts of their sitation and they were released. While imprisoned Lidl has received notice from a Jewish repatriation aid society that their daughter Susie was alive, and included an address of where she was. While Werner and Lidl did not recognize the address, it turned out to be the new home of his cousin and wife. The Dutch couple had brougth Susie to them once liberation was declared and they thought it was best that Susie had a transition period between living with them as non-Jews and being reunited with her Jewish parents. Werner and Lidl were reunited with their daughter Susie, and eventually were allowed to emigrate to the United States in 1948. 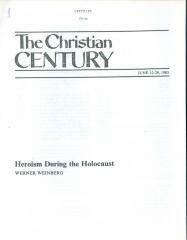 Once arriving in the United States the Weinbergs moved a number of times before settling in Cincinnati, Ohio where Werner was accepted as a fellow at Hebrew Union College - Jewish Institute of Religion. 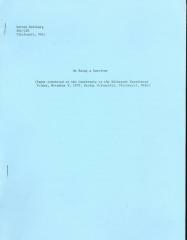 After receiving his Ph.D. in 1961 he became a member of the faculty of Hebrew Union College, a position he remained in until his retirement in 1984. Werner Weinberg died on January 27, 1997 in Cincinnati, Ohio. in the American Jewish Archives. 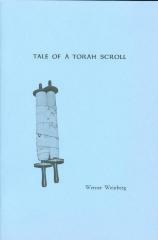 or the autobiography: "Self Portrait of a Holocaust Survivor" by Werner Weinberg, which was published in 1985.